You’ve been dreading cleaning out your cabinets for months but it’s finally time. Maybe spring cleaning finally caught up with you. Or you scored a great deal on a whole new set of dishes and you need to empty and replace the entire set. Maybe you’re moving. Or the worst case scenario – you find mold! Deep cleaning your cabinets is actually a necessary step that every homeowner should take each year at the very least to keep their cabinets in good shape and germs at bay. It’s ok if you can’t remember when the last time was that you deep cleaned your cabinets – we won’t tell. But we’ll break it down into 3 easy steps that you can tackle in an afternoon. You might be tempted to tackle the cabinets one at a time or section by section, but it’s actually more efficient and safe to do it all at once. Clear off all your countertops and dining room table if necessary, and begin unloading your cabinets. You can run all the dishes through the dishwasher while you work if they need it. Sort things by category – you may end up putting things away in a better, newer organization than they were originally. Once your cabinets are empty, take a second to look for damage. If your cabinets are damaged they can be repaired or you may consider replacing them with custom cabinets altogether. Basic Clean. Start with a duster along the outside and tops of your cabinets, because you don’t want dust to fall into clean cabinets. Next get into your cabinets with warm soapy water by using a sponge or washcloth. Consider using a steam cleaner if the cabinets are in particularly bad shape. Use a ladder to get to the very top where tiny spider webs or spots of mold could go unnoticed. Be sure to use a fan and open doors or windows to allow chemicals to dissipate as you clean – and use gloves if you have sensitive skin! Sanitize and Finish. If your cabinets are pretty clean, just wipe with an antibacterial wipe inside and on the handles. If you do see mold or suspect the wood is wet or weak then spray with a 50/50 bleach and water mixture. Leave the cabinets open to dry completely. Finish the outside with a wood polish if necessary. When completely dry and clean, place your dishes back inside in a functional way. Consider using organizers, hooks, interior shelves, and more to better utilize your cabinet space. In just a few committed hours you can deep clean your cabinets for a more sanitary, functional, and beautiful kitchen. It may not be the most exciting way to spend your Saturday afternoon, but with a good playlist and a vision for a better kitchen it just may be a little fun. 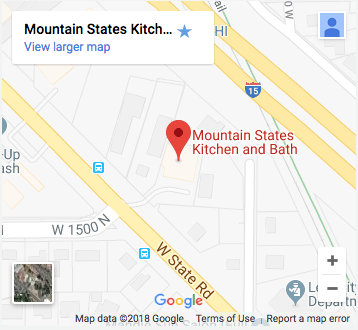 If during the process you decide that custom cabinetry is an option you’d consider – give Mountain States Kitchen & Bath a call.